Preheat oven to 400 degrees F (200 degrees C). Lightly coat a 10 inch springform pan with spray oil. Note: You could use a 9x13 inch pan instead. To make the crust: Combine 1 1/2 cups flour, 1/3 cup sugar, 1 egg and 1/2 cup butter or margarine. Spread to the edges of the pan. Prick all over with a fork, then bake 15 minutes at 400 degrees F (200 degrees C). Allow to cool. Increase oven temperature to 475 degrees F (245 degrees C). In a large bowl, combine cream cheese, 1 3/4 cups sugar, 3 tablespoons flour, 5 eggs and the yolks and mix thoroughly. Add cream and mix only enough to blend. Pour filling over crust and bake for 10 minutes at 475 degrees F (245 degrees C). Reduce temperature to 200 degrees F (95 degrees C) and continue to bake for one hour. Turn oven off, but leave cake in for another hour. Don't worry if it looks a little jiggly in the center. Chill overnight. This is imperative! If desired, top with your favorite fruit or serve plain. 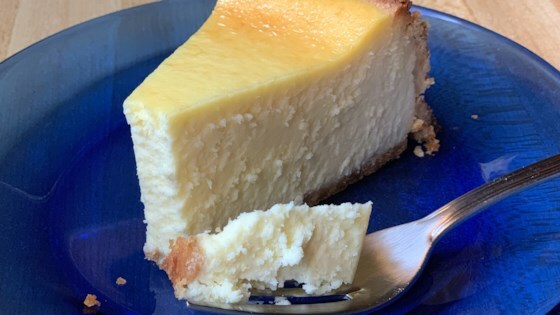 See how to make a top-rated cheesecake.